Dirty Pakistani Lingerie was one of the highlights of the fantastic Masala! Mehndi! Masti! Festival at Toronto’s Harbourfront Centre. 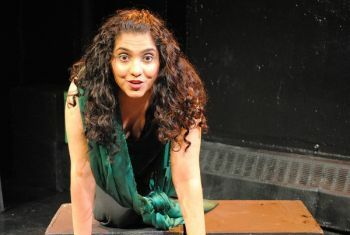 Aizzah Fatima plays six Pakistani-American women in her solo performance. The women vary in ages and life stages, but Fatima makes them all believable. She finds common thread between the very different women and cultures. Masala! Mehndi! Masti! (Spice! Henna! Fun!) is a huge festival that celebrates South Asian culture. It is the largest festival of its kind outside of South Asia. There’s something for everyone at the festival. There’s Bollywood superstars, Sri Lankan pop music stars, comedy from Dubai, celebrity chefs, an incredible array of food and kids parties. I saw South Asian children paddling canoes on the pond when I first arrived. The smile they put on my face grew bigger and bigger during my visit. There’s so much fun to share during the three days of Masala! Mehndi! Masti! that you will be planning a return visit before you leave. At first it was almost disappointing to leave the outdoor fun to join the overflow crowd inside for Dirty Pakistani Lingerie. This didn’t last though, as everyone inside, staff and patrons alike, were happy and friendly. Things got even better once Aizzah Fatima took the stage. She is an incredibly accomplished and talented person with a neighborhood full of charisma. The stage contains few props and only four black boxes. Fatima fills the stage with her remarkable performance. She’s an intelligent performer and she respects her audience. Based in New York City, she offers her audience much, much more than million dollar productions or U2’s money can. One of the props is a hijab. With just a few words about this article of clothing in a short play, I left the theatre a little less ignorant, thanks to Dirty Pakistani Lingerie. The characters that Fatima brings to life are vivid and wide-ranging. There is a young woman trying to get into a good college. There is a second generation Pakistani-American woman trying to marry off her daughter through classified ads. Another favourite of the audience was a young single woman on a flight from Chicago to New York. It is difficult to bring one character to life onstage. To command the stage, bring six characters to life, and make an audience sympathetic to all of them is something very special. Fatima does all this and more. Dirty Pakistani Lingerie offers common ground for men and women, North Americans and South Asians and really, people everywhere. At the same time that ancient traditions and truths are explored, so is “sexting” and “The Mile High Club”. A lot of warnings about the play being for an adult crowd had me wondering what to expect beforehand, but there is nothing to be afraid of. I’d bring my country in-laws to this play in a heartbeat! What I took away from the play and the festival is that “people are people”. We all want the same things, good schools, good families and good lives. It is refreshing and necessary to be reminded of this from time to time. It’s great as a Canadian to be reminded that most Americans are like Aizzah Fatima, not those nasty cartoons they call politicians. If there is anything I didn’t like about Dirty Pakistani Lingerie it is that it isn’t in Toronto longer! I lost count of how many people were saying aloud how good the play was on the way out. I’d love to see it again and there’s a long list of people I’d like to bring along. This was the friendliest festival I’ve ever attended. Dirty Pakistani Lingerie was just one of the great jewels of the South Asian festival. Everyone was welcoming and welcome. Everyone was smiling and helpful. Nothing trivial like nationality, religion, gender or age got in the way of celebration. You owe it to yourself to have a smile on your face like I did during Masala! Mehndi! Masti! you should. you won’t regret it. take some friends along.